This is an unofficial Turtle Creek Industrial Railroad Railroad railfan page. This page has no affiliation with the Turtle Creek Industrial Railroad. The Turtle Creek Industrial Railroad was owned by Dura-Bond Industries' website . 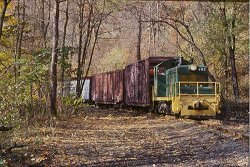 The Turtle Creek Industrial Railroad (TCKR) was an approximately 11 mile shortline southeast of Pittsburgh, running from Trafford to Export. 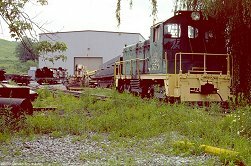 The TCKR was the former Pennsylvania Railroad (later Conrail) Export branch. 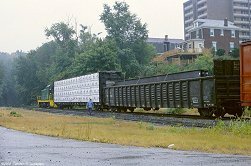 When Conrail put the line up for abandonment in 1982, the Turtle Creek Industrial Railroad took over. 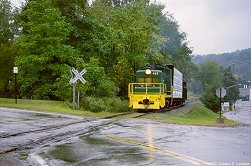 The TCKR originated at Trafford PA, its interchange with the Norfolk Southern (former Conrail) railroad. The line followed the Turtle Creek through Murrysville and continued to Export. 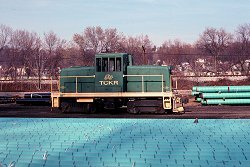 The railroad served the Dura-Bond steel plant in Export, which owns the TCKR. 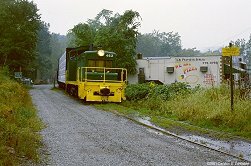 A lumberyard in Murrysville was also served by the TCKR. The line was damaged by floods in 2009 and abandoned. Dura-Bond Industries also runs a pipe coating plant at Duquesne PA. A TCKR switcher is on the property. 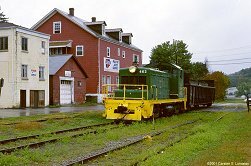 The plant is served by the Union Railroad. This is the track connecting the TCKR to Norfolk Southern at Trafford. TCKR 462 switches the interchange. September 24, 2001. Switching the interchange at Trafford. Today's train is a lumber load for Murrysville and steel beams for Export. September 24, 2001. 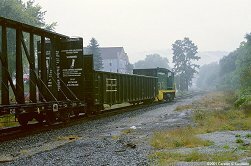 Rolling by Blackburn, September 24, 2001. About 5 miles later the train reaches Murrysville. September 24, 2001. Murrysville PA. September 24, 2001. Almost at the end of the line, in Export PA. The TCKR has a little yard here, but it's rare to see any rolling stock. Actually, the real end of the line is some 1½ miles down Old Wm Penn Hwy. A TCKR caboose has been sitting here for years. September 24, 2001. The 550 usually stays at the Dura-Bond plant in Export. Here on a picture from early summer 2000. The Dura-Bond Coating plant near Port Vue uses this switcher for internal plant work. Winter 2000. The TCKR was a little concerned that almost all my photos were shot in gray and rainy weather. So they sent me a few photos from a nicer day. Photo by TCKR.